Ohanaeze Ndigbo,a socio-political organisation has dismissed claims by the proscribed Indigenous People of Biafra (IPOB) that those hoping to vote in next Saturday’s governorship election in Anambra State will die. Ohanaeze described those calling for the boycott of the election as enemies, stressing that elections must hold. Chairman of Ohanaeze in Anambra State, Chief Okeke Ogene, who made the statement yesterday said failure of residents to vote will be creating fertile ground for enemies to thrive. According to Ogene, “ Anambra people have agreed that there will be election in the state. If there is any group saying there won’t be election, we want to put it to that group that the election must hold. “Anybody insisting that there won’t be election in Anambra State is an enemy of the people. “If such a group succeeds in creating confusion here, it will only be preparing a fertile ground for our enemies to penetrate our territory. 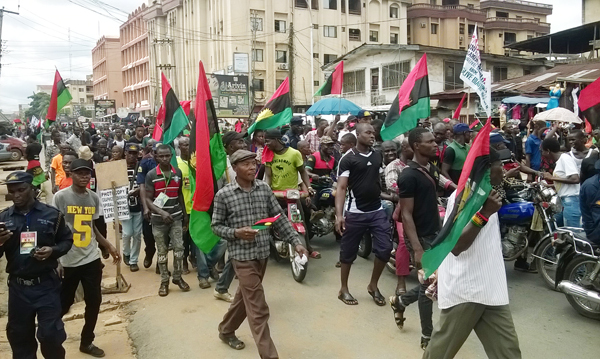 IPOB, had threatened Anambra residents with death if they come out to cast their votes during the forthcoming governorship election in the state.